The sinking of the RMS Titanic has become a symbol for the ultimate catastrophe. But in light of the various factors that led this iconic “unsinkable” ship to meet with tragedy in 1912, one very significant element is often overlooked: the Titanic‘s advertisement and marketing strategy. The White Star Line’s marketing plan for the Titanic was both wildly effective and tragically flawed. While the campaign certainly achieved its purpose of attracting a throng of passengers, significant mistakes were made that ultimately contributed to the disaster that occurred during the ship’s maiden voyage. The incident created a lasting and painful blemish on the company’s reputation. 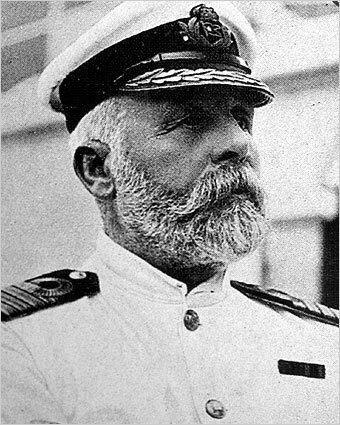 In the wake of the disaster, White Star Line’s chairman J. Bruce Ismay (who managed to survive the sinking) was skewered in the media, and retired in disgrace. Is it actually possible that the Titanic and the White Star Line’s esteem might have been saved had they simply used a different advertising strategy? We might never know for sure, but nonetheless, there are valuable lessons to be learned from the Titanic‘s marketing. The claims in this White Star brochure were somewhat embellished and exaggerated. Needless to say, this was an exaggeration. It’s true that exaggeration can convince people to buy a product; after all, the Titanic had no trouble attracting passengers. But being honest and forthright is a much better option, because it convinces prospects to come back for more. The trick is to know the limits of your product and promote it in an appealing way without embellishment. Most customers aren’t looking for “the absolute best” or a product that reaches the very pinnacle of human achievement. They just want something that can fulfill a need or solve a particular problem. They don’t necessarily want an “unsinkable” ship; they just want a ship that gets them from point A to point B. And the Titanic, unfortunately, was neither. Many of the ship’s most assertive “unsinkable” claims came not from the official marketing campaign (which usually made a point to include qualifiers such as “practically” or “designed to be unsinkable”), but from word of mouth. 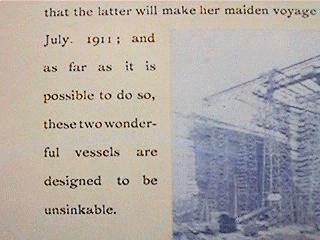 As Snopes notes, ‘unsinkable’ is a pretty grand claim even with qualifiers attached. Word began to spread amongst the public about the ship’s assured unsinkability, and the White Star marketers did little to quash these rumors. With today’s social media frenzy, word of mouth is more significant than ever, and it can often work to your advantage. But potential customers can sometimes blow your claims out of proportion in ways you might not plan for. For example, when Snapple was rumored to be in support of the Ku Klux Klan (no, really), they had to employ a major marketing campaign to set the record straight. It’s a good idea to stay on top of what the public is saying about your product and ensure that as few people as possible get the wrong impression. Captain Edward J. Smith's confidence may have been more than a bit misplaced. Clearly White Star had confidence in their products. But there’s a fine line between confidence and complacency. And it may have been that complacency which led to a terrible tragedy. If you believe that your ship is unsinkable, after all, why bother looking out for icebergs? Your marketing strategy will have an influence on the way your staff does business. If the plan is misguided, your employees will be misguided as well, and this can lead to serious mishaps. By providing accurate and helpful marketing to your prospects, you’ll also help prevent misinformation among your staff. This is one instance where the Titanic‘s marketing team actually did something right; they tailored their campaign specifically to their individual customer demographics, attracting a huge and diverse base of customers. Luxury and comfort was a major selling point of the ship, so filling the lavish first-class section with prosperous passengers must not have required a very elaborate strategy. But what about those who weren’t quite so wealthy? 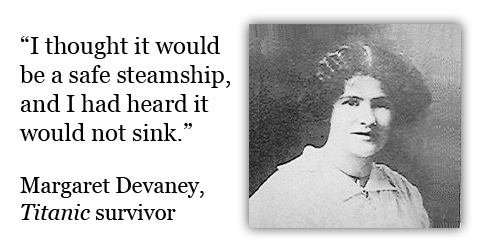 How were the Titanic‘s marketers able to engage customers of lower income? Simple: they knew their audience. Rather than try to sell potential third-class passengers exclusively on the ship’s opulence, White Star allured them with promises of a prosperous future in America. Many struggling Europeans were enticed by the idea of learning profitable skills and seeking their fortune. Seeing this desire, White Star supplied their international booking agents with brochures that addressed the precise needs of their prospects. The plan worked like a charm; sadly, many of these poor immigrants would never reach America. Market research combined with simply envisioning your prospect’s wants and needs can provide you with a fantastic advertising strategy. Just make sure that you can follow through on your promises. Regardless of the exact reason why the Titanic struck that iceberg, an undeniable oversight was the fact that there weren’t enough lifeboats. Though the ship technically met legal regulations (which were somewhat outdated), it had more lifeboat capacity than was actually used. This may have been to maximize space and “luxury” for the passengers; Dave Nielsen speculates that the lifeboats may have even been viewed as a liability to the ship’s marketing. 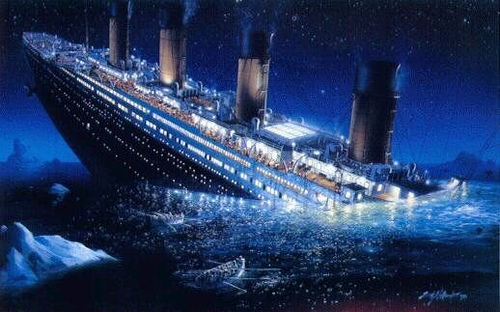 After all, if the ship were “unsinkable,” why would it even need lifeboats? Perhaps the White Star campaign felt (ironically) that passengers would feel less secure if they saw an overabundance of safety precautions. Social responsibility should always be a priority in any marketing strategy. It’s the same reason most commercials for medication include a laundry list of possible side effects. If customers face a potential risk by using your product, they need to be made aware of it. You won’t just be helping to safeguard your company against lawsuits; you may help prevent a tragedy. The safety of your customers is more important than the bottom line. The world of advertising has changed since 1912, but the essential principles remain the same. It’s vital that we analyze the errors made in the past and not let history repeat itself. By avoiding the catastrophic mistakes made by the Titanic marketing team (and emulating the more positive aspects), your ad campaign might just become truly unsinkable. Do you think that the Titanic sinking may have been a result of poor marketing? We’d love to hear your opinion; feel free to share your thoughts in the comments! haha, i think god almost like took that as a challeng, i mean i guess its possible, but i did learn alot from this article, is it okay if i use this in one of my reading roports? Sure thing, glad you found it informative! When i hear about the titanic it makes me wanna cry. It sunk on my birthday but i was born in 2000. It is so sad because the children never got to live there dream the adults never got to face there challenges. I bless everyone with safety. i dont think ad market should be blamed because they where only doing their job which is to attract people. run a campaign to attract 200 people for an event. or in other words marketer should also foresee the out come of capaign.. guess work is important. Interesting article. It brought forth ideas I had not thought about before–over confidence by crew based on false rumors that marketing did not squelch. As marketers we need to be mindful of the responsibility to be truthful. Customers are smarter today and don’t like exaggeration. Marketing was not completely successful, there was room for over 1300 more passengers.